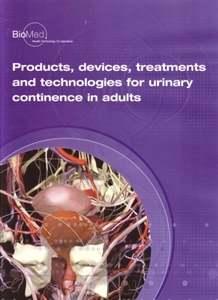 The report describes, in broad terms, the most common causes of bladder and urethral dysfunction in adults, focusing on symptoms, prevalence and the various treatment options available, including an indication of the evidence for their use. non-clinical partners engaged in research, sales, marketing or product development. The BioMed Healthcare Technology Co-operative (BioMed HTC) was set up in 2005, with funding from the Department of Health’s Health Technology Devices (HTD) programme, to stimulate and accelerate innovation in the field of intractable urinary incontinence. The HTC model, recommended by the Health Technologies Task Force to achieve this aim, is one of partnership between users (patients and carers), industry, universities and health professionals. There are a number of factors that inevitably affect the ability of such a partnership to fulfil its aims. Stimulation of innovation in an area of healthcare that has been neglected requires clinical and patient needs to be articulated in such a way that attracts technology development and transfer and identifies new opportunities for industry and research. The founding partners of the BioMed HTC recognised that there can be a failure of clinical needs to be translated into successful products. This can, in part, be due to difficulties in describing the complexity of biological systems for transformation into equally complex science and engineering solutions. This can be a barrier to innovation and discouraging for small and medium enterprises. This report has been published to help those new to the field to gain a background understanding of the area and to aid and encourage innovation.